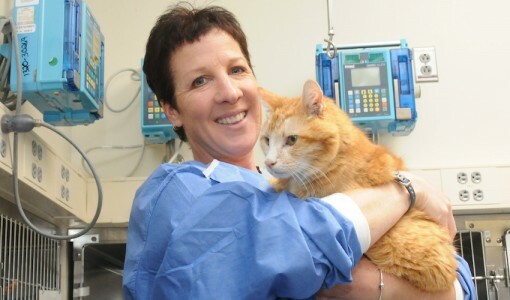 Over the course of her 30 years in veterinary medicine, Tracy Elmes has shown how dynamic and rewarding a career in veterinary technology can be. 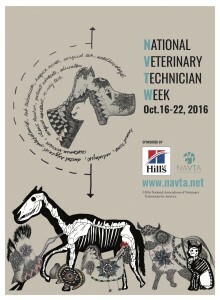 As a veterinary technician at Foster Hospital for Small Animals, Tracy has helped thousands of sick animals (and their owners), worked with countless students and vet techs to improve their skills, received her Veterinary Technicians Speciality (VTS) in Internal Medicine, and served as a charter member of the Academy of Internal Medicine Veterinary Technicians (AIMBT). 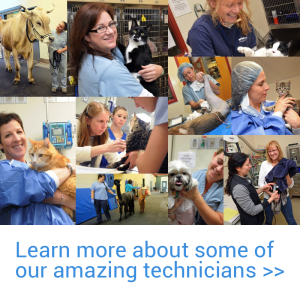 Tracey sees her job as an opportunity to help animals, students, and techs, and to continue to learn herself. 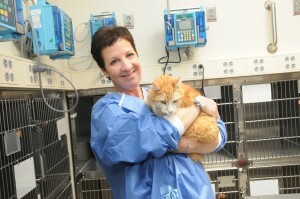 Tracy Elmes at Foster Hospital for Small Animals. Tracy is an active member of the AIMBT, and currently serves as the Credentialing Committee Chair. She’s grateful for the opportunity the position has given her to give back beyond the clinical setting. She says, “It’s the chance to share years of experience, and work with some awesome techs from around the country.” She’s passionate about others pursing a VTS in their respective fields, and though she already has her VTS in Internal Medicine, she plans to pursue a specialty in her current field, Ophthalmology. Whether at home with her six cats, on a motorcycle ride with her husband, or in the hospital with students, Tracy brings good humor wherever she goes. For this, and so much more, we salute her!